A very unusual early 19thc High hoop back Windsor armchair, made of elm for the seat, ash for the hoop and a central splat of fruitwood...unusual as I have not seen one with turned supports to the arms...it has gained a good natural colour and is stamped with the makers initials H.H. on the rear of the seat...there were several "bodgers" making these type of chairs with the same initials around this time in the area , so difficult to say for certain who was the maker. Buckinghamshire, England. C1840-60. 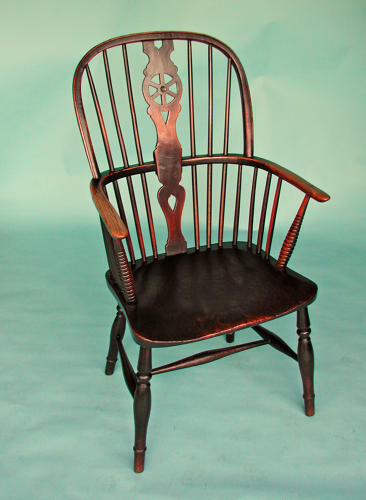 See "The English Regional Chair" by Bernard D Cotton for similar chairs and their makers.